First of all, have you entered my giveaway? There aren't very many comments on that post yet! It may not be a very extravagant gift, but it's an extremely valuable one. If you haven't already, don't forget to comment to win! I hope that you've had as wonderful an experience with Mega Memory Month as I have. The great thing is that even if you didn't meet your goal, your work has not been wasted--even a small amount of God's Word memorized is valuable truth embedded in your mind. If you've accomplished your memorization goal, your tendency may be to put it aside with a sense of satisfaction. Do that, and you'll find that in a month or so, those words won't come to mind so easily. You wouldn't want to lose so quickly what you worked so hard to attain, would you? The good news is, retaining your memory work from here on out requires very, very little of you. You don't have to look at flash cards, or spend time studying, or practice typing it out. Just say it one time through, every day. That's all! Do it while you're in the shower, or just before you go to sleep at night. Match it to an established habit so that the reinforcement practice comes automatically while you're getting dressed, while you're doing dishes, or while you're driving to work. Recite it once every day from now until May 9--about 100 days. I know, it seems like a lot. But this is not requiring anything extra of you. No extra time, no extra struggles to remember. You already know it--just say it, just once! Some days you'll forget, and that's okay. But if you do this, trust me: not only will you remember it a month from now, when others have already lost some of their work to brain fog. Two years from now, you'll still be able to rattle off the passage you worked so hard to memorize! So, are you with me? Once a day for 100 days--then it will be so much a part of your daily life that running through it again once a week or so for life will be second nature. It will stick with you permanently (or at least until your mind really starts to go!). OK, enough with the pep talk and on to my celebration :) Below is a video of me reciting Milton Vincent's Gospel Narrative. I can't bear to watch it (does anyone actually like to see or hear herself??) but Steve says it went okay, so I hope hearing these words will be a blessing to you. In the interest of full disclosure, I messed up about three lines from the end and had to stop and correct myself, so we spliced the video. I've loved meditating on this truth all month, and I look forward to seeing how God will continue to use it in my life! Recently I ran across a new website that has me intrigued. It's called At the Well...In Pursuit of Titus 2, and it's meant to be a gathering place where women can encourage, be encouraged, and grow in godliness. "Can you see them? Right there… At the Well. The women from the town are all gathered together in the midst of their daily work. Can you hear them? Gathered together… At the Well. Come back with me now to the present. Our communities have grown and we are spread out. Technology has discounted the need for a well to draw our water. However, it is still possible for us to meet At the Well, in true Titus 2 form. It has just now become a virtual well." Online "community" is no substitute for real-life community, for meeting with others face-to-face and letting them see the real you. But I still find much value in women coming together online to challenge and build each other up, so I'm interested to see how this site develops. If you make it over there by Monday afternoon, you can enter to win some great prizes, too! On Wednesday night, I had the privilege of hearing Tim Keller speak on his book The Prodigal God. Fantastic. As Steve put it afterwards, "I felt like a very small sponge in a very big ocean." LOTS to ponder and chew on. We bought the book, and I'm about halfway through it already--really, really great stuff. One thing that stood out to me was not at all Keller's main theme; it was from the Q&A that followed, when Keller offered this definition of contextualization: "using Jesus to answer the questions these people are asking--not the questions other people are asking." I know people who think that "contextualization" is a dirty word. They see it as watering down the gospel, focusing on people's "felt needs" instead of their real needs, polluting the purity of the message of the cross with worldliness. And while all of these things would certainly be wrong if that's what you were doing, I think Keller's definition is a fantastic response to this mindset. The cross is going to be offensive, yes--it is foolishness to the world, and so offense at some points is unavoidable. We must not compromise on the truth of the message; we must not remove what's essential. But why not remove what's unnecessarily offensive? Why not meet people where they are instead of making them start where YOU are? You've probably heard the slogan "Jesus is the Answer"--maybe you've also heard the snarky response: "But what's the question?" If you haven't taken the time to find out what people are asking, you're trying to slap a one-size-fits-all, bumper-sticker-platitude solution on their problems. And that's insensitive and rude. I believe Jesus does answer any question people can ask; Life and Truth are found in Him alone. But only by really hearing others' questions and seeing their hurts can we even begin to bring them the Life-Giving Answer, to love and care for them by showing them how He truly is sufficient to meet all their needs. In connection with Mega Memory Month, I'm excited to announce the first-ever Lavender *Sparkles* blog giveaway! I've been corresponding a bit with the publisher of A Gospel Primer for Christians, Jan Haley at Focus Publishing, ever since I wrote to ask permission to reprint the gospel narrative on my blog (my memory work for this month). She was very gracious in encouraging me to do so, and then told me of a new project they were working on: a pocket-sized version of the book with just the part I'm memorizing. The pocket version has just been released, and Focus Publishing has generously sent me several copies to give away. As the grand prize, I'm throwing in the full book, A Gospel Primer for Christians, which I believe is an invaluable resource for preaching the gospel to yourself. This is a book I will come back to again and again! Leave an additional, separate comment for each thing you do. Post a link to your blog post or tell me what feed reader you're using, if applicable. I'll use a random number generator to draw winners, so you'll need a new comment for each of your entries to get yourself a new number and increase your odds of winning. 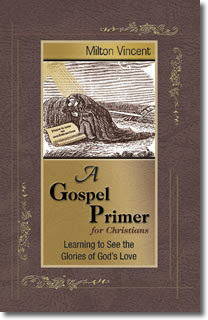 The grand prize winner will receive a copy of A Gospel Primer for Christians, plus a surprise gift. SIX other winners will receive the pocket version of the gospel narrative I've been memorizing this month, excerpted from A Gospel Primer for Christians. And a special bonus to all the hardworking Mega Memory Month participants: If no MMM participants have been drawn for the grand prize or the first five pocket versions, I will eliminate all the other entries and draw ONLY from MMM participants for the final prize! Over the weekend, I listened to a sermon by John Piper called "If My Words Abide in You." I actually thought it was a sermon on prayer that I had gotten halfway through but not finished (I couldn't remember the title of the one I'd started a couple of weeks before); to my surprise, it was a sermon on Scripture memorization. Sweet providence of God to encourage me! I hope you'll find these arguments compelling enough to make your own discoveries about the value and power of memorizing God's Word! I know I have found it an incredibly worthwhile pursuit, and I expect that the benefits of memorizing Milton Vincent's Gospel Narrative will continue long after Mega Memory Month is over. Day 26--here we are at the last Mega Memory Month Monday check-in before our final celebration on the 31st. How are you doing? I'm still on track, though for some reason I am finding that the last few days' memory work aren't flowing quite so easily as the first two weeks. In God's kindness, the truth I am memorizing dovetails perfectly with a wonderful book I've been reading--it's always a blessing when He hits me with the same message from several different places! "God's grace abounds to me even through trials. Because I am a justified one, He subjugates every trial and forces it to do good unto me." Subjugates. I had a general sense of what that word meant, but just to deepen my understanding, I looked it up. To subjugate is "to bring under control" or "to forcibly impose obedience or servitude." Jesus is the Conquering King. And when trials come to me, He is not wringing His hands, dismayed at this turn of events. He is not scrambling to try and salvage His plan. He is on the throne! And even Satan and all evil must bow to Him. He actually ordains trials in my life, because He wants me to grow in trust, in joy, perseverance, character and hope. And by His abundant grace, I don't merely survive these trials--in fact, it falls short even to say that I overcome or conquer them. "Who shall separate us from the love of Christ? Shall tribulation, or distress, or persecution, or famine, or nakedness, or danger, or sword? As it is written, 'For your sake we are being killed all the day long; we are regarded as sheep to be slaughtered.' No, in all these things we are more than conquerors through him who loved us" (Romans 8:35-37). ...a conqueror defeats his enemy, but one who is more than a conqueror subjugates his enemy. A conqueror nullifies the purpose of his enemy; one who is more than a conqueror makes the enemy serve his own purposes. A conqueror strikes down his foe; one who is more than a conqueror makes his foe his slave. Practically what does this mean? Let's use Paul's own words in 2 Corinthians 4:17: "This slight momentary affliction is preparing [effecting, or working, or bringing about] for us an eternal weight of glory beyond all comparison." Here we could say that "affliction" is one of the attacking enemies. What has happened in Paul's conflict with it? It has certainly not separated him from the love of Christ. But even more, it has been taken captive, so to speak. It has been enslaved and made to serve Paul's everlasting joy. "Affliction," the former enemy, is now working for Paul. It is preparing for Paul "an eternal weight of glory." His enemy is now his slave. He has not only conquered his enemy. He has more than conquered him. Affliction raised his sword to cut off the head of Paul's faith. But instead the hand of faith snatched the arm of affliction and forced it to cut off part of Paul's worldliness. Affliction is made the servant of godliness and humility and love. Satan meant it for evil, but God meant it for good. The enemy became Paul's slave and worked for him an even greater weight of glory than he would have ever had without the fight. In that way Paul--and every follower of Christ--is more than a conqueror. And yet I question God when hard times come. In my arrogance and ignorance I assume that because *I* see no immediate purpose in the suffering, there isn't one. Or I believe that the cost is too high, the collateral damage too great--forgetting that He has in mind not only my ultimate good, but Steve's and Elijah's as well, and that He knows far better than I do what will serve them, too. I don't know anyone who longs for trials. Wouldn't we all, if left to ourselves, choose lives of comfort and ease and abundant blessings (blessings that are obviously blessings, not blessings-in-disguise)? Yet the hard truth is that the deepest growth comes through suffering. With the clarity of hindsight, I know that my most profound lessons have come in dark seasons. And I've seen others grow more beautiful through their grief and pain. Just this morning I was reading the blog of someone I met recently and seeing the beauty of Christ in her--beauty that has come through unimaginable sorrow. Trials don't just serve us personally. Think about which makes God look more glorious, more satisfying: a believer who praises Him for a godly spouse, wonderful children, food and shelter and an exciting job--or a believer who praises Him from a prison cell, widowed, cut off from family, shivering and starving? I'm not suggesting we should wish for prison (or that we shouldn't praise God for His good gifts). But I am exhorting myself to embrace the trials God sends my way as opportunities to grow, opportunities to find deeper satisfaction in Him and see His name magnified through me. I pray that He will forgive me for failing to trust Him in trials, for crumpling in unbelief instead of standing firm in my identity as His daughter, in the promise that I am MORE than a conqueror. Stay tuned for another Mega Memory Month post coming later today--as well as an exciting giveaway later this week! the way our democratic nation changes leaders peacefully, with pomp and circumstance, the old leader applauding the new one--no bloodshed or violence. have you ever considered how amazing that is? My blog could really use a makeover. I dream of a custom, personalized design by someone really talented, but so far, have not splurged. Maybe I'll get lucky: Make and Takes is offering a big giveaway from Sherbet Blossom Designs this week! And I'm really impressed by her portfolio. This ad is airing in select markets on Black Entertainment Television. Worth a look. Day 19--we're over the hump! How is everyone coming along? Before I give my personal update, I have a couple of links to share. First is a recent interview with Ryan Ferguson at Challies.com. I first heard of Ferguson when I saw a video of him reciting Hebrews 9-10 at Worship God '06. Very powerful! He has some great exhortations to take to heart as you seek to commit God's Word to memory. And lest you think memorization is just for grown-ups...Orison Piper shows us how powerful little ones' minds are when it comes to remembering God's Word. Check out his precious dramatic recitation of Luke 2, which includes an impromptu musical interlude. Love it. As for me, I'm sort of amazed at the impact Mega Memory Month is having on my discipline and consistency. With my method, the question is generally not "Can I remember all this text?" but rather, "Can I follow through with the memory work every day?" If I do the steps, I can memorize it; it's a matter of actually doing the steps. I'm happy to report that for the last two and a half weeks, God has given me much grace to stick with my commitment. I'm excited about what I'm memorizing and haven't missed a day yet. Yesterday was a close call, though! I had recited the previous day's verse and the entire text earlier in the day, but after church/lunch/nap, got busy preparing to host some friends for dinner and completely forgot about working on the next part. I was just about ready to climb into bed when I realized I hadn't finished the day's memory work! Afraid to get behind, I ran through my sentences and then made up the journaling this morning--so I'll have to work on today's lines later this afternoon, to give the morning's work time to settle in. "Now when my time came and I placed my faith in Jesus, God instantly granted me a great salvation. He forgave me all of my sins, past, present, and future. He made me His child, adopting me into His family. He gave me the gift of the Holy Spirit, who gives me God's power, who pours out God's love within my heart, and who tenderly communicates to my spirit that I am a child of God and an heir of eternal glory in heaven." Forgiveness, adoption, power, love, an eternal inheritance in heaven--such priceless, incredible gifts! And I've hardly begun to memorize a fraction of the blessings that are mine in Christ. Today I am thanking Him for power to change and to memorize such glorious truths so that I can cling to them each day. "Does Facebook make you a bad mom?" Amy's Humble Musings had a link to an article with that name in her sidebar yesterday, so of course I had to click on such a provocative title. Having already spent far too much time in front of the computer screen yesterday afternoon, I quickly found myself convicted by the words of a mother named Cindy. Several people argued with Cindy in the comments, and it seems her post could be misunderstood, so let me be clear up front--she isn't saying Facebook is evil (she sees great benefit in it, actually); she's using it as one example of a larger topic: taking "me time" as a mom. And Cindy also isn't saying that time away from your children is evil--she quickly and repeatedly acknowledges that such time can be beneficial. I would agree with both of these statements, so please don't misread me as saying that "mom time" is wrong. Far from it. Disclaimers aside, Cindy makes some very important points about our *heart attitudes* regarding time for ourselves as mothers. And it's here that I was greatly convicted. Tomorrow I am anticipating spending some time away by myself. I'm looking forward to the opportunity to seek the Lord for an extended period of time and do some reflection at the start of a new year, and I'm so grateful for my husband's generosity and servanthood in encouraging me to do so. I trust that my time away will be a wonderful blessing--one that will translate into blessings for my husband and son. Yet, even as I appreciate having a break from my responsibilities as a mother, I recognize that to my shame, I have already slipped into the mindset that I deserve or MUST have such breaks. It is foolish for me to think I am *entitled* to "me time," selfish for me to grab as much of it as I can. And this is my tendency. Forgive me, Lord, for neglecting Your calling to invest in my son and seeking so often to escape from what You've placed before me, even without leaving the house. Cindy's thoughtful and honest post was a timely reminder that God's divine power--not some artificial way I create to "recharge" or escape--gives me everything I need for life and godliness. Time away from the normal routines, whether to meet with Him or to have fun with friends, is a cherished gift--but it is not something "owed" to me, and I cannot, must not depend on it to bring me joy or satisfaction or strength. These things come from my Savior--and I can receive from Him right here, in the midst of motherhood. One of my favorite bloggers-I-don't-know-in-real-life, Laurie, is resurrecting her blog in 2009--and I'm so thankful! Laurie has a gift for applying the gospel to real life, and she uses her blog to share those insights with us, stirring women to cherish the cross and depend more on the grace, love and power of the Savior. Her blog has a new feature called "MOMentum," which she hopes will "harness the power of the gospel to impel us forward in our pursuit of biblical womanhood." This poem is my attempt to capture three different seasons of motherhood that require patience and one all-encompassing motivator and sustainer of patience: the cross of Jesus Christ. It is inspired by my own desire to grow in this fruit of the spirit, particular in my mothering. Check out The Mother’s Fight for Patience at Ordinary Mother this week--and stay tuned for more gospel-centered posts from Laurie. The other Christmas-related thing that works for me is also shamelessly stolen from someone else :) I got this idea from Lyn, the amazing woman of God who mentored me while I was in college. One night when I was at her house for dinner, I found out that she and her family kept the Christmas cards they received in a basket near the dining room table. Each night, as part of the prayer they said before eating, they would choose a card and pray for that family. I loved the idea, so ever since Steve and I got married, we've been doing the same. Before all the photos go on our refrigerator (my other favorite thing to do with Christmas cards), we put the cards in a basket on our dining room table. Each night before we eat, we pick a card and pray. It's a simple way to remember to lift up people who are dear to our hearts and ask God to pour out His grace on them in the coming year. Visit Rocks in My Dryer for more great Works for Me Wednesday tips. Day 12...how is everyone doing? I posted last week about my (not *invented* by me, but *used* by me) foolproof memorization method. I also read some of the articles Ann Kroeker linked to in her roundup of tips and realized one of the reasons why the method works so well: it forces your brain to practice recalling. Apparently the mental processes for reading and recalling are different, so the key to effective memorization is to make your brain practice remembering the text, not just keep reading it a thousand times. The thing I've discovered about memorization, though, is that it's one thing to get a text in your head--but getting it in your heart isn't necessarily simultaneous. The downside to the method I use is that it's very cerebral. It's quite possible (ask me how I know) to repeat a text daily, to remember it perfectly, yet to not let it penetrate your soul. And that's the last thing I want. "Knowledge puffs up" (1 Corinthians 8:1)--and I don't need any help getting puffed up. So this month I've added a step to my memorization process, in an effort to slow down and really meditate on the text. Spending five or ten minutes repeating sentences requires little of me; interacting with the words in my journal takes me deeper. I've found that so far, this memorization effort has been much more meaningful as I sit down with my journal and Bible after repeating the day's sentences. I write out the new text from memory, then look up and copy the corresponding Scriptures footnoted by Vincent in the book. Then I spend a few minutes praying through the texts and asking God to drive the truth deep into my heart. "However, what I could not do, God did--and in doing it, He did it all, sending His own Son into the world to die on the cross for my sins, thereby showing me unfathomable love." My tendency each January is to make a laundry list of resolutions. A lifelong perfectionist, I have no problem seeing hundreds of things I could change, and for a few deluded moments, I actually believe it's possible to tackle them all: marriage, parenting, homemaking, food, exercise, intimacy with God, serving the Body, serving the lost, using my talents, working at friendships, personal hobbies...OY. My ambition and hope for change quickly turn to discouragement when I am inevitably reminded of my frailty, my pathetic lack of willpower. I doubt I am alone in my despair and my propensity to give up quickly; we've all heard the statistics about how quickly January diets are abandoned. Maybe God means for us to see painfully clearly that we cannot reform ourselves--that all our resolving and planning and buddy systems to change habits cannot change our hearts. This year, I'm praying that God will show me what He would have me focus on in the coming months. I pray He'll give me the grace to persevere in those things, yet even more importantly, I need the grace to humbly depend on Him to cover my inadequacies and failures everywhere else. He alone is perfect, and I become either puffed-up or completely deflated when I try to be. I pray that He'll teach me to rest in Him--to fight, yes; to strive with all my might and to labor with His energy at work in me--but also to stand firm in my identity as His daughter. As I try to grow in 2009, I want to do so in the certain hope that HE is in the business of transforming hearts and lives, knowing that His acceptance of me is not secured by my performance, but by the perfect performance of Jesus on my behalf. It's sort of crazy to think I have done this ninety-nine times. But it gets more positive feedback than pretty much anything else about my blog...and I always need to cultivate the attitude of gratitude...and so each week, I list my thanks. And try to make it a habit in between Thursdays, too. Years and years ago, long before I ever got married, let alone became a mother, I picked up this idea from a cousin of mine. My mother would give gifts to her nieces and nephews' children, and one in particular always sent thank-you notes. But not any thank-you notes; these were postcards. And not just any postcards; these had pictures--of the adorable recipient of the gift! I loved the idea, and filed it away for the future. The first time I had the opportunity (Elijah's first Christmas, last year), I used it. It was a hit. This is a win-win situation for everybody: I save money (places like Snapfish offer 9-cent prints, and postcard stamps only cost $.27 instead of $.42) and the gift-givers get cute pictures to hang on the fridge! 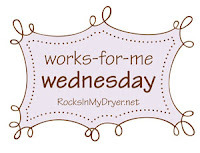 Visit Rocks in My Dryer for more great Works for Me Wednesday tips! Not pressing Enter is rude to your readers (unless you just don’t care, but that’s rude, too). More than once I have wanted to read someone's lengthy blog post, but given up before the end because my eyes just can't take the one giant paragraph of text. It's especially hard/important if your blog template features a narrow column for posts; the narrower your text, the shorter your paragraphs need to be. I know I have been guilty of this, so I'm reminding myself as well: Hit Enter more often than you think you should. Seriously. MMM: How Do You Memorize? We're five days into Mega Memory Month, and perhaps you're wondering: How do I tackle this project? We've all memorized plenty of things before--multiplication tables, important dates, vocabulary words. But how much of what you once memorized has long since disappeared from your brain? I've crammed for tests, only to forget all the information just hours later, let alone days or weeks. I've memorized Scripture before, only to have it fade from my memory. Forget no more. The beauty of the memorization method I've discovered is that not only is it easy, but it also encourages long-term retention. Here's how well this method works: Two years after memorizing Romans 8 using this method, I can still rattle off the whole chapter pretty easily (I just had Steve test me the other day). Read the verse 10 times out loud. Cover the page and recite it 10 times out loud. "Cheat" if you have to! Then move on to the next verse. Read it 10 times out loud, then recite it 10 times out loud. Yesterday's verse first--recite it 10 times (again, look if you need help). Recite all the verses you know, one time through. Move on to the next verse. Read 10 times, recite 10 times. Davis stresses including the verse numbers, but like many others, I don't do these. I know what chapter it's in, and approximately where, and that's good enough for me; I'd rather not have the numbers interrupting the flow of the passage. For more explanation and tips, read the full article. It may sound like a lot, but it really only takes a few minutes. It's effective because you're repeating what you know every day, which helps it to stick. And once you're all done with the passage, you cement it in your brain long-term by repeating it once a day for 100 days. That may seem daunting, but think about it: Doing so doesn't take any time out of your busy day at all, because you don't have to look at your Bible. You can recite the passage while you're doing dishes, or taking a shower, or driving to work. I'm sold on memorization now. Deliberately hiding God's Word in my heart has been a really meaningful practice for me, so I've continued with other passages. I'll admit that some have stuck more solidly than others; I haven't always followed through with the 100 days of reinforcement. But I'm still convinced that this method works better than anything else I've tried. Romans 8 still comes to mind every now and then, so I go through it. That keeps it fresh, and of course has the benefit of bringing my focus back to God and His truth during the mundane moments of the day. Got any other memorization tips to share? I'd love to hear them in the comments. Ann Kroeker has also posted a collection of resources and suggestions in today's progress report. As for my own memorization work this month, so far so good. Like I anticipated, Milton Vincent is a lot easier to memorize than Paul! Today, the most amazing man I know turns 27. How can I sum him up in a blog post? 2008 was a rough year for me, one I'm glad to put in the past in favor of a fresh start. Through its darkness, my beloved husband was a bright, steady light. How thankful I am for his patient, giving, consistent, selfless, hopeful love. (And his sense of humor--I genuinely think he is hilarious.) I honestly don't know how I would have survived without him. Steve is, without question, the most precious earthly gift the Lord has given to me. I don't deserve him, but I don't take him for granted, either--may I never do so! I have so much respect and admiration for this man and count it an honor to be his wife. I pray that God will grant him many, many more birthdays--years for me to love him and to laugh with him and to love and serve our Savior alongside him. Happy New Year! Today marks the kickoff of Mega Memory Month. Last week as I pondered what to work on, I picked up Milton Vincent's fantastic little book A Gospel Primer for Christians. "God did not give us His gospel just so we could embrace it and be converted. He offers it to us every day as a gift that gives to us everything we need for life and godliness. ...Use this book to preach the gospel to yourself daily and you will be amazed at the difference it will make in your life." Suddenly I knew exactly what to memorize. The Gospel Primer, which I first heard about a couple of years ago, has been an incredible encouragement to me. The book begins with 31 "Reasons to Rehearse the Gospel Daily," outlining some of the powerful effects of the gospel in our lives. It then provides prose and poetic versions of a gospel narrative, which summarizes and paraphrases scores of Scripture passages. I've chosen to work on memorizing the prose narrative this month--a daunting project, but without a doubt worthwhile. Released in book form just this year, A Gospel Primer for Christians is worth every penny of the $10.95 it costs here (shipping is free). It is an invaluable resource for preaching the gospel to yourself! I have also been told that a pocket-sized version of only the prose gospel narrative (below) will be available soon--I'll post details when I have them. My God is immense beyond imagination. He measured the entire universe with merely the span of His hand. He is unimaginably awesome in all of His perfections, absolutely righteous, holy, and just in all of His ways. He has also been unbelievably good and merciful to me as the Creator and Sustainer of my life. Every breath, every heartbeat, every function of every organ in my body is a gift from Him. Every legitimate pleasure I experience is a gift from His loving hand to me. All that I am and all that I have I owe to Him and to His goodness. My life in every way is, and will continue to be, utterly dependent upon Him in whom I live and move and have my being. This wonderful God is the most supremely worthy Object of admiration, honor, and delight in all of the universe; And He has created me with the intention that I might glorify Him by finding my soul’s delight in Him and by living in joyful obedience to Him in all of my ways. Yet I could not have failed this great God more miserably than I have. Instead of giving thanks to Him and humbly submitting to His rule over my life, I have rebelled against Him and have actually sought to exalt myself above Him. Going my own way and living according to my own wisdom, I have broken countless times either the letter or the spirit of every one of God’s Ten Commandments. Thinking myself to be wise, I have shown myself to be a fool; and because of my arrogance, God has every right to damn me to the everlasting experience of His terrifying wrath in the Lake of Fire. So as for myself, apart from Christ I am bound by the guilt of my sins and also bound by the power of sin, enslaved to various lusts and pleasures. Apart from Christ, I am also utterly deserving of and destined for eternal punishment in the Lake of Fire, completely unable to save myself or even to make one iota of a contribution to my own salvation. However, what I could not do, God did—and in doing it, He did it all, sending His own Son into the world to die on the cross for my sins, thereby showing me unfathomable love. God loved me so much that He was willing to suffer the loss of His Son, and even more amazingly, He was willing to allow His Son to suffer the loss of Him at the cross. Jesus loved me so much that He was willing to lay down His life for me. No one could ever love me more or better than Jesus. On the third day after Jesus’ death, God raised Him from the dead, thereby announcing that His death was completely sufficient to atone for every sin that I have or will commit throughout my lifetime. God then exalted Christ to His own right hand, where Christ now reigns from on high, granting salvation and forgiveness to all who call on Him by faith. Now when my time came and I placed my faith in Jesus, God instantly granted me a great salvation. He forgave me all of my sins, past, present, and future. He made me His child, adopting me into His family. He gave me the gift of the Holy Spirit, who gives me God’s power, who pours out God’s love within my heart, and who tenderly communicates to my spirit that I am a child of God and an heir of eternal glory in heaven. In saving me, God also freed me from slavery to any and all sins. I no longer have to sin again, for sin’s mastery over me has been broken! In saving me, God also justified me, and being justified through Christ, I have a peace with God that will endure forever. In justifying me, God declared me innocent of my sins and pronounced me righteous with the very righteousness of Jesus. God also allowed His future and present wrath against me to be completely propitiated by Jesus, who bore it upon Himself while on the cross. Consequently, God now has only love, compassion, and deepest affection for me, and this love is without any admixture of wrath whatsoever. God always looks upon me and treats me with gracious favor, always working all things together for my ultimate and eternal good. God’s grace abounds to me even through trials. Because I am a justified one, He subjugates every trial and forces it to do good unto me. When I sin, God’s grace abounds to me all the more as He graciously maintains my justified status as described above. When I sin, God feels no wrath in His heart against me. His heart is filled with nothing but love for me, and He longs for me to repent and confess my sins to Him, so that He might show me the gracious and forgiving love that has been in His heart all along. God does not require my confession before He desires to forgive me. In His heart He already has forgiven me; and when I come to Him to confess my sins to Him, He runs to me (as it were) and is repeatedly embracing and kissing me even before I get the words of my confession out of my mouth! God does see my sins, and He is grieved by my sins. His grief comes partly from the fact that in my moments of sin, I am not receiving the fullness of His love for me. He even sends chastisement into my life; but He does so because He is for me, and He loves me; and He disciplines me for my ultimate good. I don’t deserve any of this, even on my best day; but this is my salvation, and herein I stand. Thank You, Jesus. "A Gospel Narrative: Prose Version” from A Gospel Primer for Christians, Milton Vincent. Focus Publishing, 2008 (p. 57-65). Reprinted with permission from the publisher.